Dhikala is the finestand greatest safari zones in Jim Corbett National Park, and the entrance to this safari zone is called Dhangari gate. Dhikala safari zone is a faultless spot, where tourists can just freely unwind their heart, mind, body and soul to the Nature. Dhikala offer tourists verdant spot, to take fabulous view of entire wildlife gets wild. Dhikala is the tourist zone lying in Jim Corbett National Park where you would just hear the sweet chirping of birds' chirps, the rich and natural aroma and not to speak about the divine ambience. A Center drive through the abundant trails acrosschaurs is contented with unearthing of wild elephants, chital, hog deer and several plush grassland bird species and of course raptors. Dhikala's old rest house at Dhikala is a historic structure that is built over a hundred years ago. Dhikala like the other zones of Jim Corbett gives a fabulous glimpse of flora and fauna to get through. Once the tourists get through the Dhangari gate, they get through Corbett safari. It is significant to note here that tourists, who take safari should have permit to make an overnight in The Corbett tiger reserve. Jim Corbett National Park Dhikala Canter Safari / Dhikala Day visit Canter Safari in a great safari which will take the tourists through the natural trail. The Center is scheduled to carry the tourists from the Ramnagar at 5:30 AM and 11:30 Am. A Center can only accommodate maximum of 16 passengers in a particular trip. It takes approximately 5 hours safari to take through the Dhikala zone. 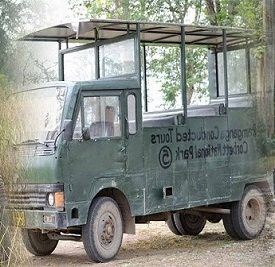 This is the only available choice for day visitors for exploring the unbeatable wildlife of Dhikala. Furthermore, a maximum of 4 Centers can go inside the zone in a single time. Corbett tiger reserve expert guide as well as forest gunman also accompaniesthe tourists inside the Center. It is important to note that Dhikala Center permits are booking in advance online basis.